“Season Planning is for more advanced coaches”. “I’m just coaching a house league team, I don’t need to invest that much time or effort …”. While repeating these comments, I firmly believe that community coaches want to do a good job working with their athletes. And, many do have a practical perspective on their coaching careers that is rooted in reality that it takes more than just being a “good coach” to win, anything, in a team sport. So, what can give you an advantage? Planning, of course! Hockey Canada and the Ontario Minor Hockey Association (OMHA), have some of the best and most current resources to help coaches plan an upcoming season. I would like to supplement these fabulous resources with a simplified version that can, in under one hour, help a coach develop an effective plan for the upcoming season. The graphic illustrates the breakdown of the type of activities that a coach can schedule into a practice session, as well as provide a summary of when during the season the coach should implement specific changes in emphasis, in order to achieve the best possible training environment for his/her athletes. Coaches require a calendar for the upcoming season, and an idea of how many games and practices they will be working with in this season. You can then identify which Skills/Drills you will be working on at various points during the season. The numbers in Phase 1, and the correlated arrows in Phases 2 and 3, relate to the percentage of the available practice time. For example, if you have a 50-minute practice based on the flood being built into your hour, The Warm Up and Cool Down would require FIVE minutes each to complete. The season can be split into three or four sections, depending on the level of competitiveness of the team. For a recreational or house league team, consider three Phases. For a more competitive team, consider splitting the season into four Phases. How the Phases are defined is up to the coach and they do not have to be equal in length. For example, you can use a number of days, or the time of the season (pre-season, in-season, playoffs) to define your transition points. Depending on the THEME of your practice, you may choose to change the emphasis, or order, of the “three T’s”. 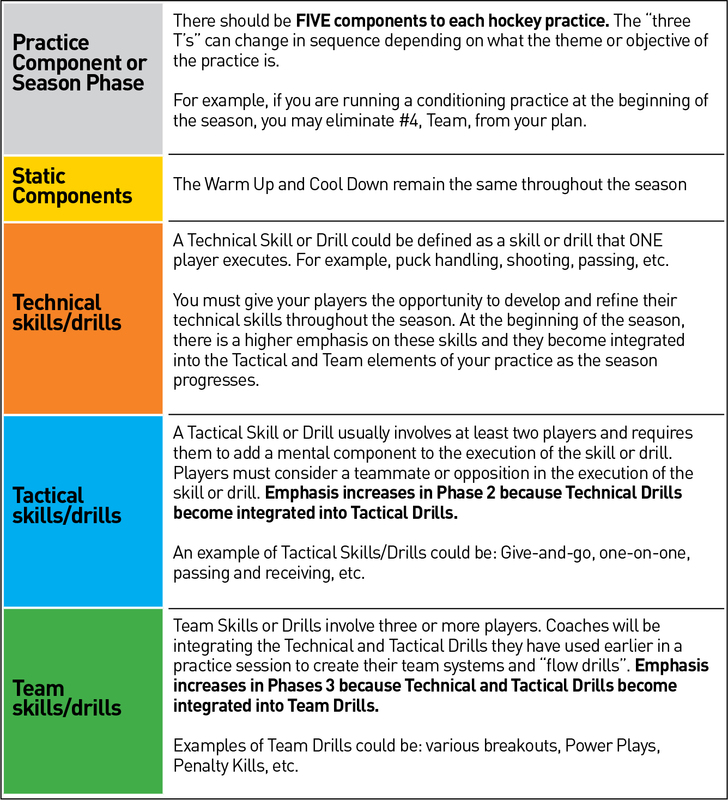 The table above represents a simplified illustration of what a practice session could look like (Column noted in Phase 1) in terms of time spent on each component, as well as how much emphasis should be put on the various components (W/Up and C/Down, Technical, Tactical, Team Drills) of each practice over the course of the season. Coaches can usually define the exact Technical Drills, and even the Tactical Drills, that their players require at the various Phases of the season, even before it starts. The Team Drills can be adapted to the needs of the team, as the season progresses. The key to success in this planning exercise is to take your OMHA rink pad and define the Technical and Tactic emphasis for each practice, and organize them in a binder based on your knowledge of how many practices per week you expect to have in the coming season. As the season progresses, you can identify the TEAM requirements based on performance, and have your plans ready for implementation when you arrive at the rink! A few minutes of planning prior to the season creates an athlete focused environment for hockey coaches and guaranteed success in terms of organizing your season! NOTE: This planning template is a guideline for organizational purposes and should be adapted to the coach’s practical coaching environment. Wayne Parro is the Executive Director, Professional Coaching, at the Coaching Association of Canada (CAC). He has recently been an assistant coach with the York University Men’s Hockey program, is an OMHA Coach Developer, a multi-sport Coach Developer, and a Master Learning Facilitator for Baseball Canada. He can be reached at [email protected].